Linux is not lacking at all for email programs. The frontrunners include Evolution, Thunderbird, and KMail, all of which are feature-rich PIM suites (see the "PIM" box). Many users just need a simple mail program and nothing else. The stable of slimmer applications that fulfill simpler needs includes the rather ancient Gnome tool Balsa, Claws Mail, and the fairly new Geary. PIM stands for personal information manager. This type of software handles tasks like mail, contacts, notes, and scheduling. PIM software, particularly on mobile devices, plays an increasingly important role for private users alongside its traditional role in the business and professional worlds. Trojitá was built on version 5 of the Qt libraries, and for some time now, it has been trying to enter this product category. Before it can qualify as a viable alternative, this newcomer needs to be evaluated with an eye toward the fact that it only works with the IMAP protocol (see the "IMAP" box). Since almost all of the providers offer access via this protocol, this restriction does not disqualify the software outright. Currently, there are no plans to extend its capabilities to other protocols. IMAP is an Internet access protocol that was developed more than 30 years ago. It lets the user retrieve emails from a server where they continue to be stored. This means that moving, deleting, and copying emails takes place on the server and not on the local computer. to add the repository's key and avoid annoying messages about unsigned repos. You will find Trojitá in your launcher. 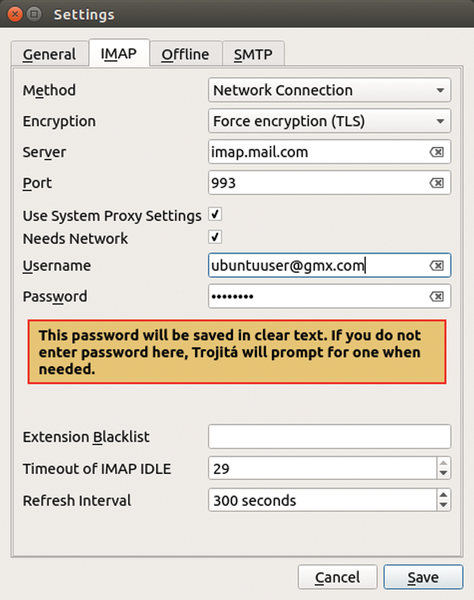 To set up an email account, open the setup dialog by clicking on the IMAP | Settings menu. Clicking on Add brings up a screen where you can enter your name and email address. A single click on Save stores the data, which however is not quite all that is needed. Established competitors like Thunderbird, KMail, and Evolution refer to the domain in the address line when they search for the correct settings in terms of server and port. Trojitá does not yet do this. The parameters for receiving messages are entered in the IMAP tab (Figure 1). The online help offered by providers usually tells you what you should enter here. Typically, this includes information like the server's name, its port, and the encryption technology used for transmitting your messages. Figure 1: This is where you configure the Trojitá mail client for receiving messages. Similarly, the SMTP tab (Figure 2) is used for entering data for sending messages. In most cases, it is a good idea at this point to remove the check mark from the Save outgoing mail option, since almost all providers automatically save copies of sent messages in the Sent folder. Moreover, sending the first messages in our test failed because the program was unable to find the default Sent folder. 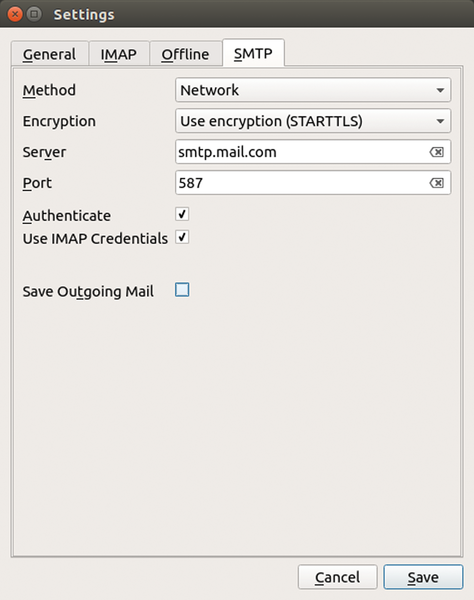 Figure 2: Configure the sending of emails in the SMTP tab. Last, but not least, you should go to the Offline tab and indicate how the program should handle messages that have already been called. By default, Trojitá saves emails for 30 days. If you do not trust your provider's data security practices, then you should select the Store forever option. Although the settings might give you the impression that the application is able to administer multiple accounts, this is in fact not the case. The program does permit a user to provide more than one identity, but the parameters for receiving and sending remain the same. You can remedy this situation by collecting emails from various mailboxes on the server into one mailbox. Trojitá's current version can correctly handle aliases if you enter multiple addresses. Aliases are available from free software communities, which tend to be especially generous in giving them out. However, the aliases actually consist merely of redirects rather than a genuine mailbox. These alternative addresses should nonetheless be properly registered with your email provider; otherwise, you will not be able to successfully send emails since the server software assumes that the address is fake.